Quite a large week this week – with no collections! And I think every Image comic I buy came out this week. Weird. I can’t believe it took me this long to realize that DC Universe: Legacies is structurally the same as the 1999 mini-series Superman and Batman: World’s Finest. 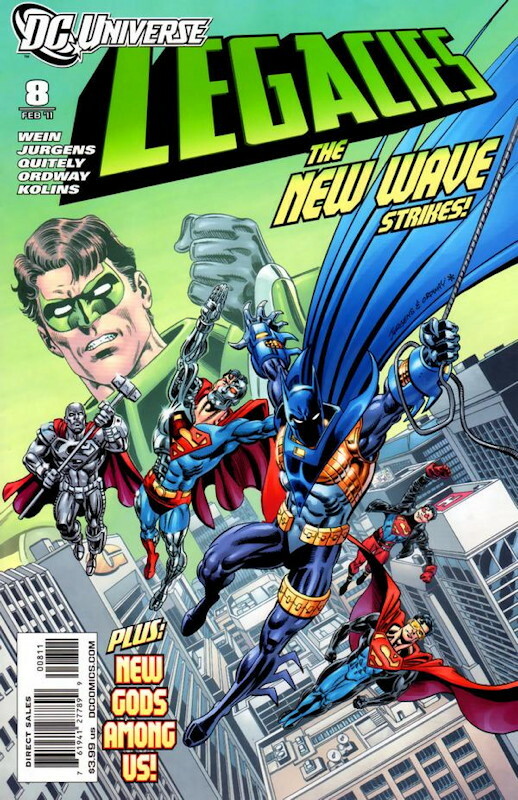 In fact, this issue walks the same ground as issue #9 of that series, the replacement Superman and Batman from the mid-1990s (plus the Green Lantern/Parallax development). I’ve always had a soft spot for the World Series series, which had an understated story exploring the development of Superman and Batman’s friendship (which started off strained) and some surprisingly good artwork from artists I was not generally familiar with. 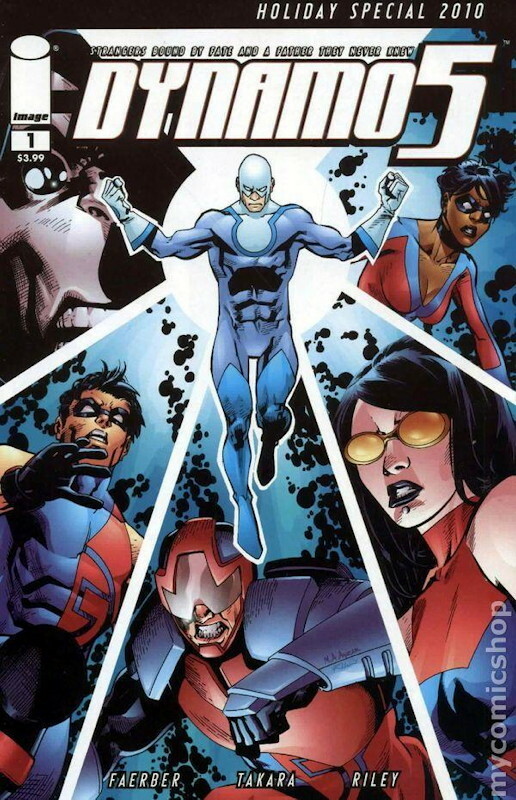 Despite having higher-profile artists, including some of my favorites, Legacies is not as good a series. The framing story of a Metropolis policeman watching the DC Universe develop from the late 1930s to today is pretty generic and progressing slowly, and not as strong as the (still fairly loose) background story in World’s Finest. Plus, another survey of DC’s history doesn’t really seem necessary; I’d been hoping this series would be more than that. With 2 issues left, there’s time for writer Len Wein to pull a rabbit out of his hat and make this series something surprising. But after 8 issues, it looks like what we see is what we get. It’s okay, but nothing special. Jonathan Hickman’s Fantastic Four is on the cusp of its first big development, the death of one of the team members. While I’ve felt the series has been rather slow and even dull so far, his manipulation of the build-up to “Three” has been pretty good, putting the heroes into perilous situations where any of the might die: The Thing has reverted to human form for a month, just as some minions of Annihilus attack the Baxter Building, which he, the Human Torch and the kids must defend. 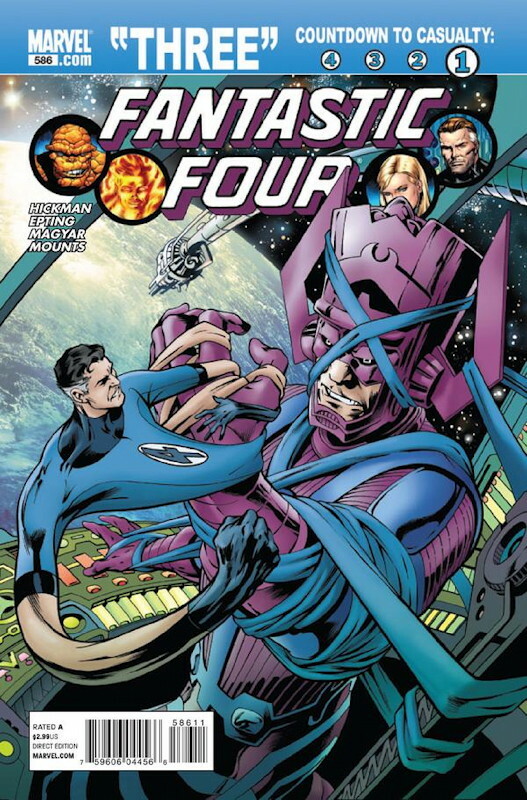 Mister Fantastic has gone into space with Galactus to find the corpse of the world-devourer’s future self, and Reed is trying to evacuate the remaining inhabitants of an artificial world before Galactus destroys it. (This is a pretty clever extension of a story laid down by Mark Millar in his run on the book.) And the Invisible Woman is trying to stave off a war between the Sub-Mariner and his kingdom and the more-sinister-than-they-appear (according to Namor) prehistoric Atlanteans who have recently reappeared. While I’ve been skeptical of Hickman as a master-planner so far (his S.H.I.E.L.D. series has been pretty unconvincing as a millennia-long-global-conspiracy yarn), how he’s assembled the pieces here is actually pretty impressive now that I see it. This is hardly the first time one of the FF has died (or at least been pronounced dead) – it feels almost as old hat as the team breaking up – but it’s how the ramifications of the death are handled which will make or break the event. And of course Steve Epting’s art is always a joy to see. He’s got everything Brian Hitch brings to the table, but with superior layouts faces that seem more realistic. How this guy isn’t a superstar by now, I don’t know. Since I last checked in with Dynamo 5 in my blog, there’s been a mini-series (Sins of the Father) and now this holiday special. The characters have recently had their powers switched around among them, a gimmick I’m not really a fan of: It always seems to suggest that the writer either has run out of ideas for the original set-up, or he decided that the original arrangement was the wrong one, and in this case I think the new arrangement is a definitely downgrade to the original. That aside, the story in Sins was pretty solid, leading up to a big cathartic moment for Smasher, the team’s strong-man, who in everyday life is a wimpy kid. This one-shot involves the team trying to track down an escaped super-villain, who seems to have attacked two teenage girls. Not all it what it seems, of course, but unfortunately the heartwarming holiday payoff isn’t really plausible or satisfying. Moreover, I’m not real big on artist Marcia Takara (who also draws Incorruptible for Boom, where I’m also not a fan of his), as I find his sketchy finishes, simple layouts, and minimal backgrounds really make the book not very attractive. I’d say to give this one a miss, except that it wraps up with five short epilogues portending future story directions, and they’re pretty good. But then, I expect what we learn here will be recapitulated when the plot points come to fruition. So yeah, the holiday special isn’t required reading unless you’re already on-board the Dynamo 5 train. If you’re not, either wait for the next mini-series, or pick up Sins when it arrives in trade paperback.